Corporate debt has increased substantially. Share buyback programs have been financed by debt. A credit crunch could cause systemic dysfunction. The shale oil Ponzi scheme is part of the problem. 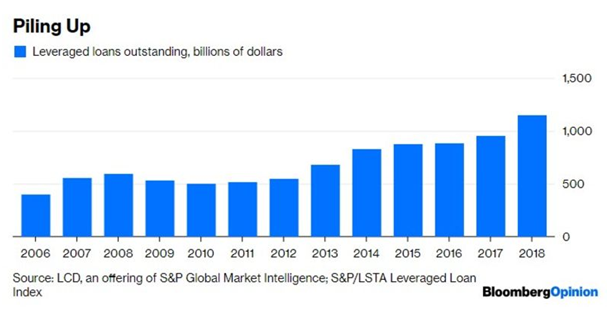 The amount of corporate debt has increased substantially in the last decade.The graph below shows how leveraged loans have more than doubled since 2006. This is not a financially healthy situation. What is really alarming is that there is a high-percentage of covenant lite loans. 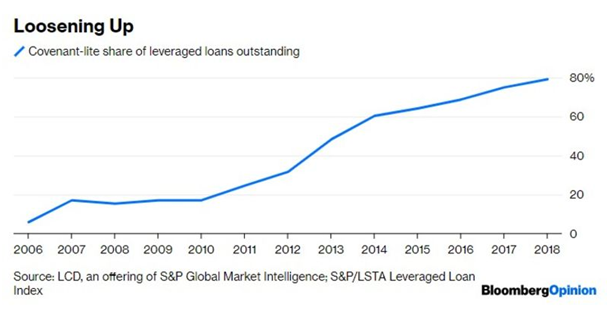 If the share of covenant-lite loans in 2006 was around 10%, this became 80% in 2018. Another source of worry is that the ratio of debt to EBIDTA has risen, and that means that companies have taken on more debt than they should have. A 5.25 ratio is rather high. Another aspect of the problem is that company ratings have been falling as debt increases. A BBB- rating is barely above junk status. There is thus an inverse relationship between debt and ratings. 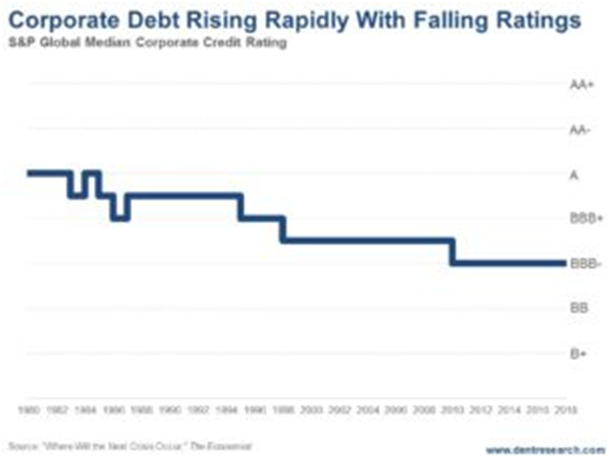 The higher company debt goes, the lower the ratings go. "U.S. corporate debt has risen from $40 trillion to $70 trillion since the top of the last bubble in 2007. That’s 63% in 10 years. It’s risen 135% since 2000!" "Of course, many of these bonds are simply financial engineering to buy back stock to increase earnings per share. Uber-low long-term interest rates thanks to QE have allowed companies to do this cheaply. The problem is these long-term rates have been rising since just July 2016. They’ve gone from 1.38% to 3.10%. That’s an increase of 172 basis points in the risk-free 10-year Treasury bond. That naturally reverberates up through the risk spectrum from investment grade corporate bonds to junk bonds." This is a very large increase that has so far turned out to be sustainable. The FED must have realized that raising interest rates to 3% or over would have resulted in such a large amount of debt becoming unsustainable and turned dovish in March 2019. It is important to understand that companies have concentrated on financial engineering to boost stock prices by implementing share buyback programs that have been financed by debt. The capital has not been invested in R & D (Research and Development) or in Capex (Capital Expenditure) in order to strengthen the company and make it more resistant to a crisis or recession. Capital has been grossly misallocated, and the economy is basically weaker than it should be and therefore more prone to suffer disastrously when there is an economic downturn. What is more is that the share buyback programs have taken place when the market is extremely overvalued and share prices are very high. Companies seem to like buying HIGH and do not worry about selling LOW. Jeff Cox also dealt with the same problem from a slightly different aspect in November 2018. Companies are carrying a $9 trillion debt load, posing a potential threat should rates continue to rise and the economy weaken. Most Wall Street bond experts think the issue is contained for the next 12 to 18 months, though one says the market's "angst" is "not misplaced." A principal worry is over companies teetering between investment grade and junk that could cause market trouble should their standing deteriorate. Total corporate debt has swelled from nearly $4.9 trillion in 2007 as the Great Recession was just starting to break out to nearly $9.1 trillion halfway through 2018, quietly surging 86 percent, according to Securities Industry and Financial Markets Association data. Other than a few hiccups and some fairly substantial turbulence in the energy sector in late-2015 and 2016, the market has performed well. In fact, Fitch Ratings forecasts bond defaults for 2019 at the lowest since 2013, with leveraged loans at the lowest since 2011. Such high debt levels are "certainly something to take notice of," said Eric Rosenthal, Fitch's senior director of U.S. leveraged finance. "In terms of the systemic risk, at the moment it's not there." Susan Lund suggested in June 2018 that it was a good thing that corporate debt had shifted to bonds and that there was little danger of a corporate debt bubble bursting. However, in view of the exorbitantly large sums of debt that corporations have accumulated in the last decade, it really does seem that complacency is not in place in this situation. Then there is the shale oil Ponzi scheme to be considered in the context of corporate debt. Even with an oil price over $60 small and medium-sized producers are still going to have to cope with negative cash flows. As the oil majors crowd into shale oil, they too will find that the rate of well depletion is so high that continually more capital is required to keep production at a high level. The amount of debt owed by the shale oil producers is extremely high. At a certain point investors are going to stop financing operations that are cash burners just as investors have begun to tire of the hype over Tesla automobiles. Given such a situation with such high debt levels, a tightening of credit could swiftly bring about a systemic crisis. Fear of widespread defaults could cause investors and banks to be unwilling to finance zombie companies and those with negative cash flow. An economic slowdown could crimp company profits and slow down the rate of corporate share buybacks, which in turn could result in a stock market downturn in as much as share buybacks are a main support of high stock market share prices. The federal debt is increasing at a fast pace, and the Treasury is going to need a lot of money to cover budget deficits. The government could thus soak up significant amounts of liquidity as it covers its need for cash. Of course if the market does not come up with liquidity, the FED could always buy Treasury paper, and then one would see the FED balance easily go over five trillion. If that is what will be necessary to avoid a liquidity crisis and the ensuring credit crunch that would result, it will be interesting to see how far the FED will go.